This salad is a little pricey because of the feta cheese but it is SO EASY to prepare! You can even do it with your eyes closed. And it’s so refreshing, so delicious because the tomato’s sweetness flavour is enhanced by the feta cheese and basil. !! Feta cheese already contains a lot of salt so this recipe doesn’t require any salt. 1) Using a rice cooker or pot, cook and chill the quinoa. 2) Wash and quarter the tomatoes. Set aside. 3) Next, mince the garlic finely and set aside. 4) Next, crumble the feta cheese into smaller pieces and set aside. 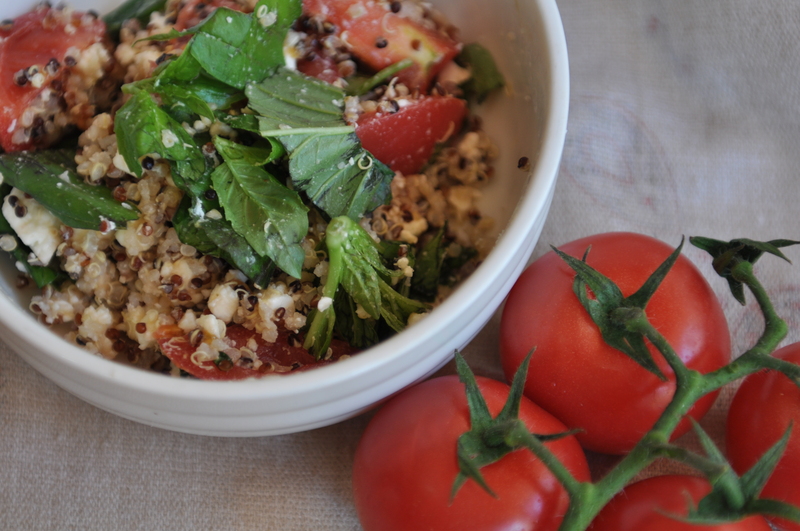 5) Once the quinoa is cooked, place into a large bowl. 6) Add in the basil, feta cheese and tomatoes and mix together. 8) Grab your spoon. Serve and enjoy!